Gossip front woman Beth Ditto capped off an amazing year with her very revealing memoir, Coal to Diamonds. 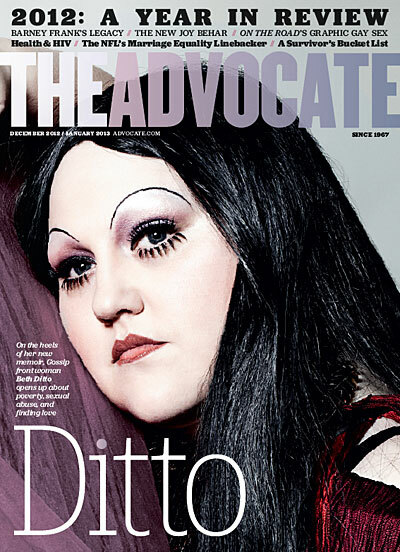 Twenty years ago, Beth Ditto was a loud, fat, sexually confused choir nerd with permed hair and a Kool-Aid dye job in rural Judsonia, Ark. It was a town where girls often got pregnant before high school ended, as Ditto’s mother, Velmyra, did. When Ditto was a child, she didn’t yet know the truth about who her biological father was (it was, she thinks, “too sad and exhausting” for her mother to explain it), and her mother was overwhelmed by the demands of men, motherhood, and rural poverty. Ditto was shuttled between the homes of Velmyra and her foul-mouthed aunt Jannie, the beloved dictator of a house filled with neglected kids. Today, Ditto, 31, is a world-famous iconoclast, the reigning queer queen of indie music. Ditto has revolutionized fashion by insisting that big girls need a place at the table. She’s become a muse to a host of fashion designers, launched her own fashion line with Evans in the U.K, and walked down the runway for designer Jean Paul Gaultier. She was the face of Donatella Versace’s Versus line at Milan Fashion Week in September and has launched her own line for MAC Cosmetics. Then, of course, there is the music. Ditto is one of three members of Gossip, a post-punk indie rock band formed at the end of the riot grrrl days in Olympia, Wash., in 1999. Gossip’s newest album, A Joyful Noise, debuted in Billboard’s top 100 in the U.S., but in Europe — where Ditto enjoys David Hasselhoff–like fame — it reached the top 5 in four countries: Austria, France, Germany, and Switzerland (where it was number 1). The group’s previous album, Music for Men, sold over a million copies worldwide; the gold record hangs in Velmyra’s double-wide trailer. In 2007, after Gossip performed on Friday Night With Jonathan Ross (he’s the U.K.’s equivalent of David Letterman), the band became celebs and Ditto was vaulted into superstardom.